My First Robotics camp gives a perfect introduction to Robotics using the Lego WeDo construction sets, which are based on the latest science standards to promote hands-on learning. 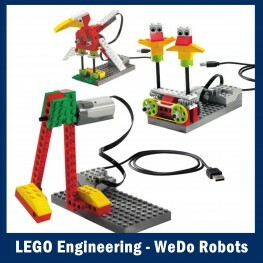 Students will build animals and machines that move, turn, tilt, sense motion, and more. Activities are divided into 4 themes: Amazing Mechanisms, Wild Animals, Play Soccer, and Adventure Stories. We will build, program and have a lot of hands-on fun with Legos. The camp uses a drag and drop software powered by Labview. Various sensors are attached to our designs to build amazing interactive creations. This class is the first step into our amazing Robotics Program.